The second book in the Pondlife Series; a magical fantasy tale of a young girl, her brother, and friends in the world of Pondlife, where they encounter magic, shapeshifting, fairies and monsters in a battle between good and evil. Since winning the battle at Meadowstream a few weeks ago, Issie Hartford should be happy. After all, it was her magical powers as well as the help of her brother and friends that saved the pond and its inhabitants. However, all is not well. The Crystal of Myrrdin still has a sliver, called the Acus, missing, and the link between the mystical world and the world of the top dwellers cannot be restored. As a result, her father remains trapped in the body of a frog and is growing weaker with each day. He can’t morph back until either the Acus is found or a protection spell from a sorceress called Baboozle, is used. There are rumours of Baboozle seeking revenge, and the pond creatures are reluctant to help. Issie thinks her Aunt Ida and Mrs Fullerlove, who both possess magical powers, are keeping secrets. 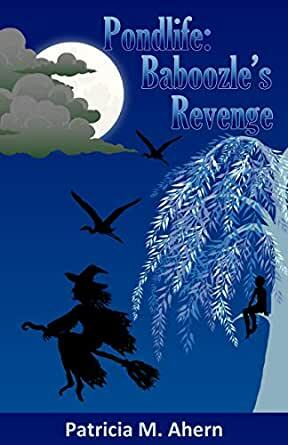 Despite warnings about the dangers, Issie’s frustration makes her determined to act and, once again, Issie, her, brother, and friends find themselves carried away in a whirlwind of adventures. The discovery of a statue leads to the meeting of Fernwig, an elf, the solving of a riddle, and a journey into the Lands Beneath. Old and new foes emerge. After the pond is attacked by herons, events become worse when Baboozle and her snewt, Badira, appear. What does Baboozle want? And why does Issie feel a strange connection to Badira. In a bid to get answers, Issie puts herself in grave danger and Aunt Ida, Mrs Fullerlove and the children go to her aid. Tragedy strikes and secrets from the past are revealed, changing the relationships of all concerned.